State and local governments obtained 23 percent of their combined tax collections from general sales taxes in the 2012 fiscal year (the most recent year available). 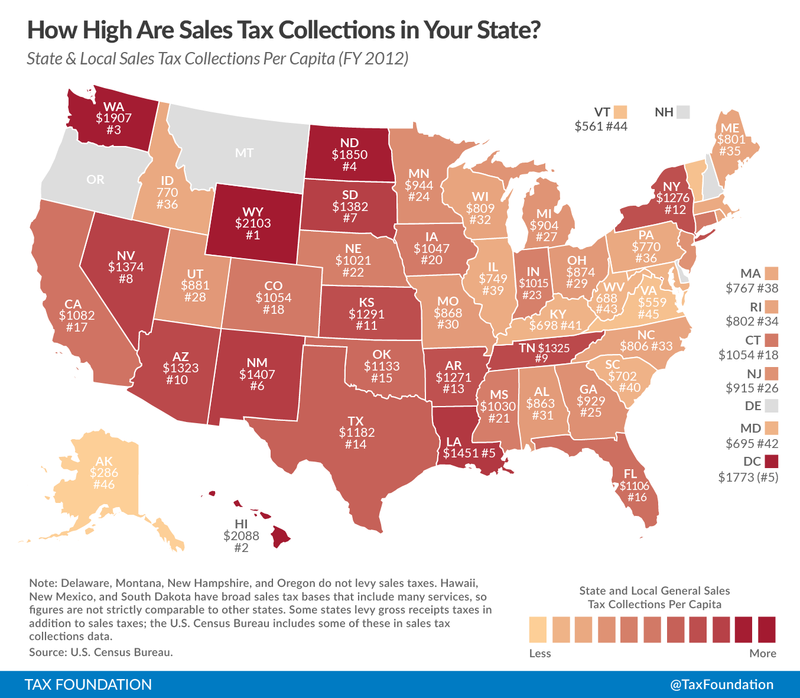 This week’s map shows the amount of state and local sales tax collections per capita in each state. On average state and local governments collected a combined $1,007 person in the 2012 fiscal year—but some states vary significantly from this average. For example, four states have no sales tax: Delaware, Montana, New Hampshire, and Oregon. Alaska does not have a state sales tax, but does have local sales taxes. The five states with the highest state-local sales tax collections per person in 2012 were Wyoming ($2,103 per person), Hawaii ($2,088 per person), Washington ($1,907 per person), North Dakota ($1,850 per person), and Louisiana ($1,451 per person). Rounding out the top ten are New Mexico, South Dakota, Nevada, Tennessee, and Arizona. Alternatively, the five states with the lowest sales tax collections per capita (not including those states that don’t have a sales tax) were Virginia ($559 per person), Vermont ($561 per person), West Virginia ($688 per person), Maryland ($695 per person), and Kentucky ($698 per person). You can find the data used to create this map here. 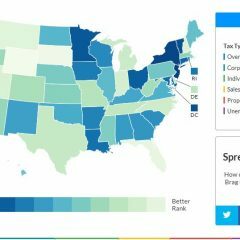 Where Does Your State Stand on State & Local Debt Per Capita? How High Is the Tax on Recreational Marijuana? Do We Adjust Our Income Tax Brackets for Inflation?